The more I paint, the more ways I discover to mess up a painting. Heheh. And it's interesting, because sometimes the things that will mess a painting up-- are the exact same things that will make it really GOOD. Things I did that may or may not have messed this painting up: Not using more than 3 hours to do it, using only olive green in the underpainting, pushing the shiny high-lites a little harder and restraining myself from over-blending. Actually, I'm not entirely unhappy with it, I guess I'm just realizing how much there is yet to learn. Thanks for contacting me and for your kind comments!....I would be honored to exchange links with you...Your painting style is very accomplished for just starting out! 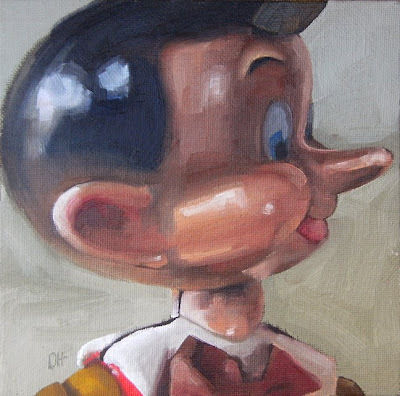 I will look forward to seeing your progress..Love the Pinocchio series! Really, very good work! I am originally from Cleveland as well , Mayfield Village! Oh, JOY! Thanks so much, Robin!